I’m a copywriter. 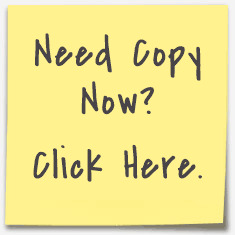 I provide copy and content to clients around the world. I also market and sell information products. If you hire me to write copy, you take full responsibility for the content. If you buy one of my information products, I do not guarantee any type of result. You also agree to pay me based on the terms we negotiate. For return and guarantee information, please see the individual sales pages and materials. If you decide not to pay me, I reserve the right to set up a website/blog telling the world that you have not paid me. Once I’ve been paid, I’ll disable the site. You might find other terms and conditions on this site.